A wealth of unique history and culture mixed with luscious Mediterranean living truly sets Croatia and Slovenia apart! Experience the highlights of Zagreb, explore the shore of Lake Bled surrounded by the majestic Julian Alps, revel in the Dalmatian coast of the Adriatic, observe the beautiful Bay of Kotor, among many more breathtaking features. This was my 19th trip with smarTours in 21 years – and it was absolutely wonderful! My first visit to the area (formerly Yugoslavia) was 41 years ago, and the beauty of the countries brought me back 14 years ago with smarTours. Our guide Rok filled our minds with the incredible history of the area – from ancient times to current. Meanwhile, we absorbed the breathtaking scenery in the care of our most capable driver Sludgen, as he navigated the winding roads through and around the mountains.Someone commented that the Dalmation Coast of Croatia was more beautiful than Italy's Amalfi Coast (or our own California coastline, for that matter). Absolutely true, because the Croatian coast is probably longer. There are 1,000 islands that parallel it, and the mountains seem to tumble into the turquoise waters below. All along the drive, from Zadar to Montenegro, communities with red-tiled rooftops dot the bays and inlets.For anyone who loves culture and history, this is the trip for you – but if you just want to absorb absolute beauty, you won't be disappointed! Your fascinating journey to Croatia & Slovenia, the “Jewels of the Adriatic“, begins as you depart today on your overnight flight to Europe. Day 2: Arrive Zagreb (Croatia). Arrive in historic and elegant Zagreb, the capital of Croatia. You are greeted at the airport and escorted to your deluxe downtown hotel. Along the way, you’ll witness the signs of a prospering city and country. Visitors from around the world are warmly welcomed here! This evening, your tour director hosts a briefing followed by welcome dinner. Morning guided tour to explore some of the highlights of gracious Zagreb. Visit the Upper Old Town and see St. Stephen’s Cathedral and St. Marks Church. You’ll also visit colorful Jelacic Square and wander the surrounding narrow alleys. Proceed to the historic Mirogoj Park Cemetery, known for its opulent sculptures and arcades. The remainder of the day is free to explore this delightful city on your own and perhaps visit the impressive Mimara Museum with its unique arts and crafts collection. After breakfast, journey through the lush countryside and cross the nearby border to the Republic of Slovenia. Arrive in the thriving capital of Ljubljana where you’ll explore the unique architecture and admire the work of Joze Plecnik, a 20th-century architect and Ljubljana native, that made significant contribution to restoring the city that suffered from a devastating earthquake in 1895. You’ll also see some buildings that survived the earthquake and still stand in the charming historic old town. The old town is dotted with small shops and numerous outdoor cafes and restaurants. Stroll along the riverside promenade and visit the bustling and colorful open air market. This afternoon proceed to the enchanting resort town of Lake Bled, situated on the lakeshore and surrounded by the majestic Julian Alps. Enjoy dinner at your hotel tonight. Start your day with a guided stroll around emerald-green Lake Bled. You’ll also visit the Bled Castle perched high on a cliff above the lake. The afternoon is at leisure for independent exploration of this charming village. You may join a relaxing cruise around the lake. Day 6: Lake Bled/Postojna Caves/Opatija (Croatia). Slovenia’s pastoral countryside unfolds as you depart Lake Bled today to the mysterious Postojna Caves, the second largest in Europe. Here, ride a train to view the impressive stalagmites and stalactites. Later, proceed to the fashionable Riviera town of Opatija, arriving at your seaside hotel in time for dinner. Day 7: Opatija/Optional Istria Peninsula Excursion. Today is at leisure to explore Opatija’s Austro-Hungarian grandeur, stroll along the waterfront promenade or relax in one of the many cafes and restaurants. You may join a delightful optional excursion to the picturesque towns dotted along the scenic coastline and the exciting surrounding landscape. Enjoy a thrilling ride today to Plitvice Lakes National Park, a string of 16 turquoise colored lakes linked by 92 waterfalls and cascades and surrounded by densely wooded mountains and lush vegetation. This afternoon enjoy a short scenic boatride and a leisurely walk along the lakeshores. Admire the awesome waterfalls and the magnificent natural beauty. Your hotel is located inside the National Park! Depart beautiful Plitvice National Park. Later, drive to Zadar, the oldest Slavic town on the Adriatic Sea and once famed cultural center. Pause here for an orientation tour that includes a visit to the Roman Forum’s ruins. Continue along the spectacular coast to Trogir, the center of artistic activities where scholars from around the world gather to study and paint. Arrive in Split in time for dinner. 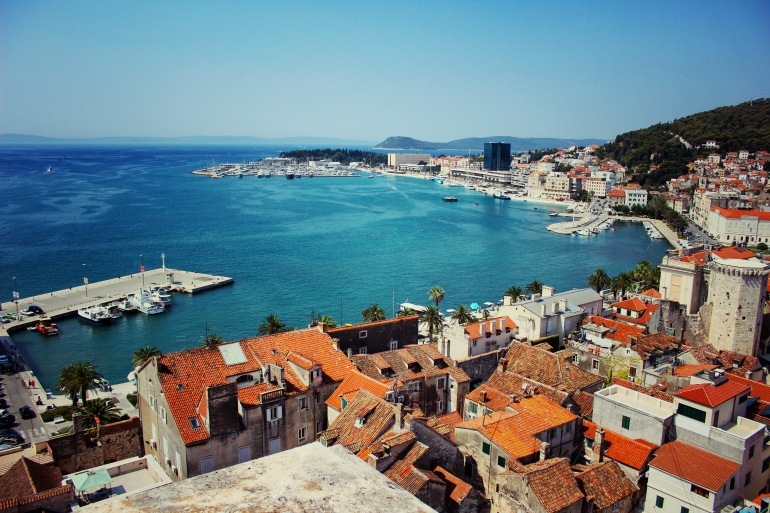 Located in the center of the Dalmatian coast and nestled between the mountains and sea, Split is a picturesque ancient town built by the Roman Emperor Diocletian. On your guided tour, visit the impressive Emperor’s Palace built in the 3rd century. This afternoon, delight in a breathtaking drive along the spectacular Dalmatian coast of the Adriatic, dotted with palm trees, olive groves and idyllic fishing villages. Late this afternoon arrive in Dubrovnik, one of Europe’s best preserved walled cities founded in the 7th century and now declared a World Heritage Site. Arrive at your seaside hotel. Dubrovnik is certain to enchant any visitor! Thick age-old walls surround the ancient port town. The winding cobblestone streets are filled with old red-tiled roof houses and distinctive medieval age buildings. Enjoy a guided walking tour through “Old Dubrovnik” and see the harbor, the Franciscan monastery and the stately Baroque Cathedral. The afternoon and evening are at leisure to discover the treasures of the historic old town at your own pace. Today, drive across the border to the Republic of Montenegro and the beautiful Bay of Kotor, the longest and deepest fjord in Southern Europe. Enjoy a breathtaking view of the bay and learn about the rich history of the area. You’ll then take a boat ride to “Our Lady of the Rocks,” one of the two islets off the coast of Perast, a charming old town on the Bay of Kotor. The largest building on the islet is a Roman Catholic Church that was built with the help of the sailors who passed by the bay, with each sailor making their own unique contribution to the construction of the church. Later, after enjoying brief visits to Perast and Budva, return to Dubrovnik via a short ferry ride across the scenic bay. A full day at leisure to explore splendid Dubrovnik on your own, join an optional excursion or shop for local arts and crafts in the colorful local market. This evening, join your fellow travelers for a farewell dinner at a famous local restaurant. Day 14: Dubrovnik / USA. Morning transfer to the airport for your return flight. Your memorable journey ends as you arrive the USA later today.